Join us for good food and fun at the Junior Board Meet and Greet at Nando’s Peri-Peri! Meet our new Touching Heart Junior Board and hear all about what inspires them to volunteer and give back! Congratulations to our new Junior Board! 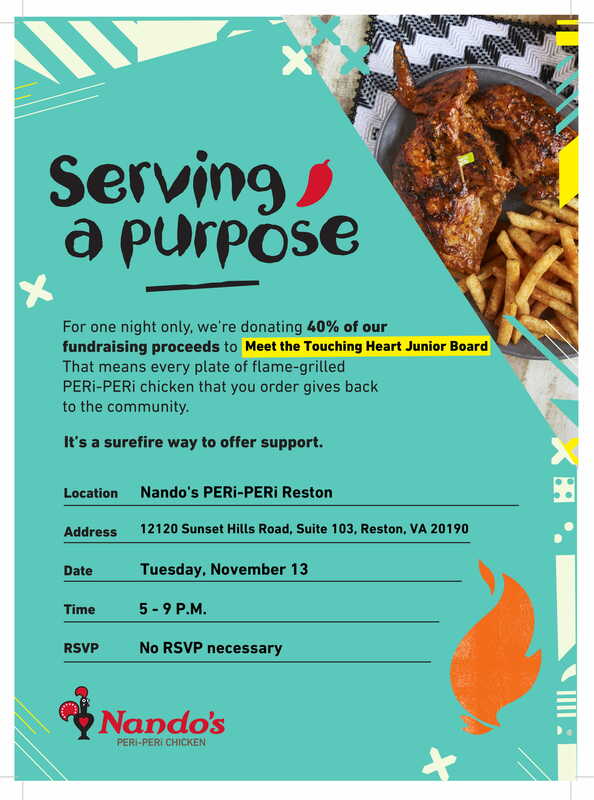 Nando’s Peri-Peri is generously donating 40% of the sales from this event to support Touching Heart programs! Please remember to bring the paper or electronic flyer so that your meal will go towards Touching Heart’s fundraising goal! Our generous supporter, Diane Do, is going to be hosting Crystals for a Cause at our Junior Board Meet and Greet! She is donating 50% of the commission earned, so come stop by to meet our amazing Junior Board and check out some beautiful pieces from Touchstone Crystal by Swarovski! If you cannot attend this event, check out the website link where you can still purchase items and the proceeds will support us! So bring your family and friends and help us inspire more kids!